With a small paring knife cut peaches in quarters and pull away from the pit. With your paring knife “filet” the flesh of the peach away from the skins. If possible, do this over a clean cutting board where you can reserve the juices to go into the pan. In a sauce pan combine peaches, salt, and brown sugar. Cook on medium heat until sugar is melted and the liquid from the peaches evaporate. As liquid evaporates, the sugar will concentrate causing the jam to thicken. Continue to stir the mixture so that it does not stick and burn to the bottom of the sauce pan. 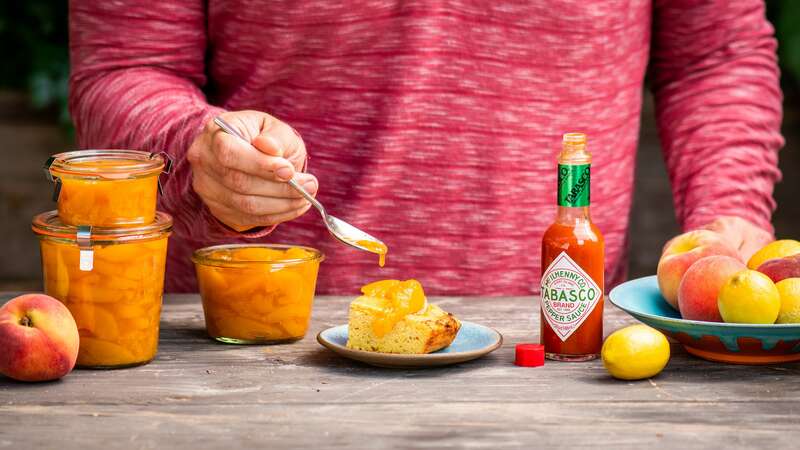 Once the mixture looks “syrupy” pull from the heat and stir in the lemon juice and TABASCO® Pepper Sauce. Set aside to cool thoroughly and use at a later date. Keep refrigerated.